156 pages | 30 B/W Illus. Many scholars have claimed that management accounting research has lost its pragmatic relevancy and interventionist research has been proposed as one way to produce theories with increased practical implications. In interventionist research, active participation in the field is regarded as an asset rather than a liability. Despite the methodological debate on interventionist research, there is lack of empirical studies on how interventionist research actually helps to produce theories with such pragmatic relevance. The lack of empirical studies has, perhaps, resulted in a too narrow connotation to the research approach. This book attempts to shed light on the various nuances of interventionist research and the positions a researcher can occupy when trying to produce contributions associated with both theoretical and pragmatic relevance. This book is based on various research projects focusing on different aspects of management accounting during the past ten years. 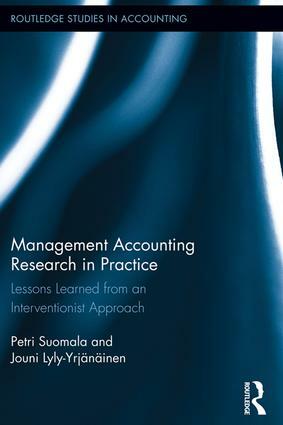 To spice up the academic debate, the book also provides managerial perspectives on interventionist management accounting research with interesting new insights. In addition to management accounting, the ideas of interventionist research can also be applied in other management fields. Jouni Lyly-Yrjänäinen has a PhD in Industrial Management and been conducting interventionist research projects in the field of cost management for over ten years. Deep involvement in the development processes of the case companies has led to numerous research papers as well as several patents. Petri Suomala holds M.Sc. (Eng) and Dr.Tech. in Industrial Engineering and Management. Currently the head of Department of Industrial Management and the director of Cost Management Center (CMC), she has been involved in various interventionist research projects in the field of cost management for about fifteen years.